I did not sleep well, the burns being uncomfortable. The swimming did JJ in though, so he decided to sit out of the morning plans for Si’an Ka’an. This time lathering plenty of sunblock on and wearing clothes over my burns, Herr and I drove twenty minutes south to Muyil ruins. 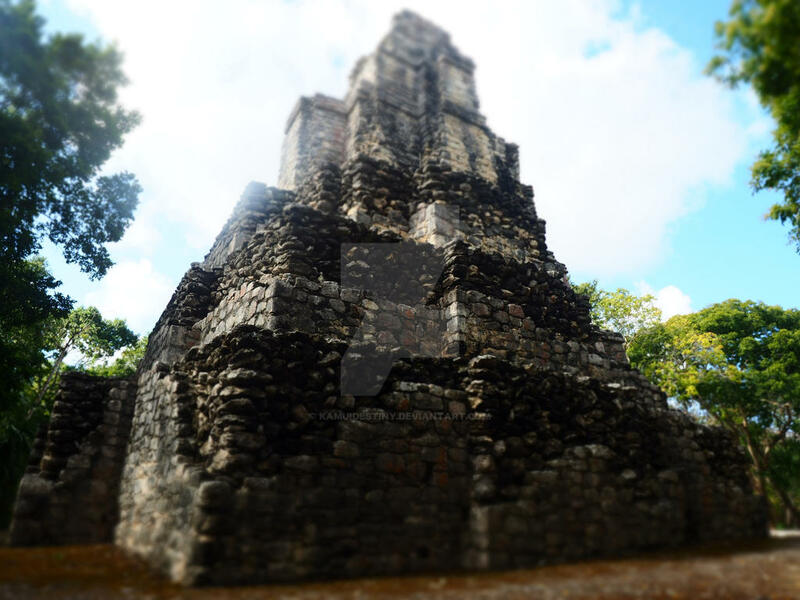 They weren’t much to look at, but it was quiet and the “castle” structure is the tallest in Quintana Roo. 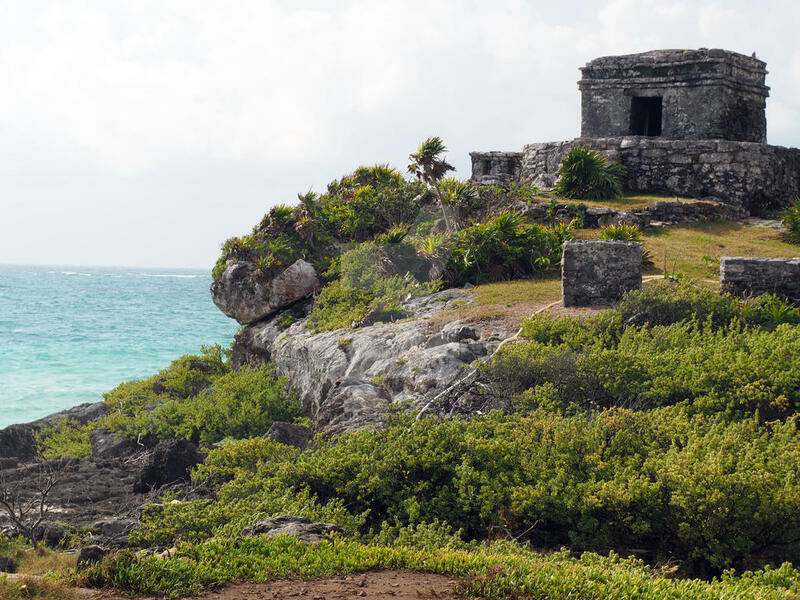 Behind the large temple is a sacbe, and following a path that paralleled the ancient road brought us to an entrance for Si’an Ka’an Biosphere Reserve, a UNESCO heritage site. For 50 pesos each, we entered and followed a raised boardwalk through the wooded jungle. A guide would have been useful as we were unable to appreciate much of the flora and fauna (the interpretive signage was minimal). Halfway along the walk is a watchtower. It has a slightly rickety feel to it, but we climbed up “at our own risk” (like most activities in Mexico, it seems to be their motto). The stairs were more effectively ladders, but the view rendered was decent. Herr brought along binoculars and found them useful here. The lagoon was visible, but mostly we saw treetops, so I was perplexed what the watchtower was used to watch. The remaining walk to the lagoon was short, and after puttering around the docks (we decided against taking the recommended two hour boat tour due to extensive exposure to the sun – the boats were not covered). So we walked back the way we came, saw a few more ruins, and drove back to the hotel. By this point I was lightheaded and not well. After attempting a nap, my health worsened; I stayed behind as the others went for lunch. Between intense stomach pain and sunburns, there was no comfort. I made one final excursion to pick up a few gifts, then I was done. I did manage to pack after a few hours, but when the guys went for a late dinner, I had to decline again. Liquids were barely staying down. At this point, I was considering sun poisoning. That night was horrible. An intense nightmare of Mayan rocks that I couldn’t escape. The feeling is hard to explain but terrible to endure. At 2:30 a.m., I was finally able to get some relief and a little sleep. Our last day in Mexico, and I still did not feel good. In fact, the symptoms suggested seeking immediate medical care. Good times. I managed a light breakfast, but the 1.5 hour drive was quiet as talking made it worse. We dropped JJ off first for his earlier flight then returned the car. Returning it took considerably less time. We arrived nearly four hours before our flight. The time seemed to fly though, moving at turtle speeds to keep breakfast down. We found JJ on the inside and hung out for a while until his boarding. Our boarding went smoothly. The beach always seem like a fun place, but it rarely works out that way for me. Finally, a beach day! We ate breakfast at the hotel a whole hour later and took our time driving to the coast. We finally figured out how to get to the public beach, via a beach club. 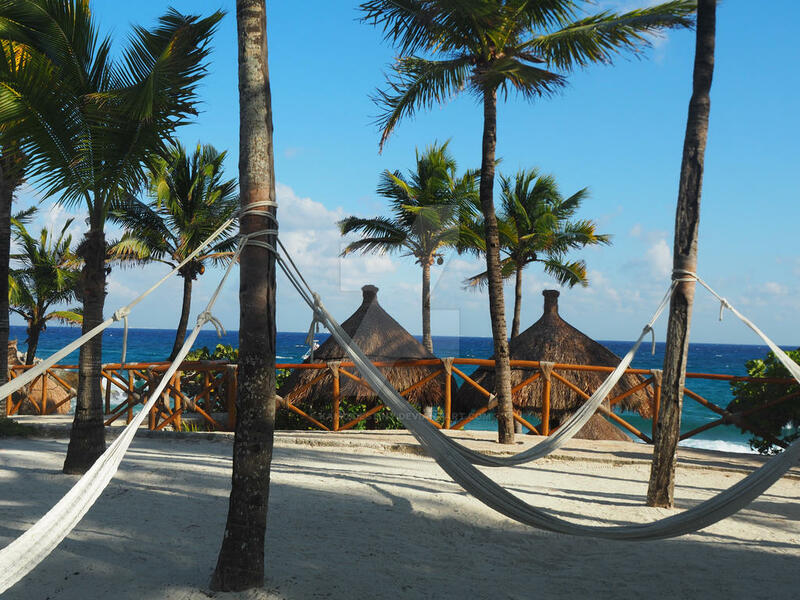 Playa Paraiso had the best reviews, but it opened at 10 a.m., 45 minutes after our arrival. So we backtracked a few blocks, parked on the side of the road, and followed a sandy path over a small hill onto the expanse of beach. Washed up kelp acted as a barrier to the ocean, so we laid down our towels near a break in said wall. Herr and JJ proceeded to lotion up and sunbathe, Herr getting my back and I neglecting my front. This would be my undoing, a sad lesson in sun burns. Per JJ’s alarm, we flipped every twenty minutes. I only participated for two and a half flips before proceeding into the water. It was windy, and the waves were considerable. I had misgivings about being in the water alone as I had bad experiences with undercurrents when visiting Pasadena as a child. So I stayed in shallow water, which was super salty. One could only take so much before needing a break or one’s eyes might dry up from so much salt! Around 10:30 a.m., we packed up to go to the now-open beach club and rented a cabana for 250 pesos. Herr joined me in the water this time, so we stayed in longer. We all dried off at the cabana, but alas, half of me took a good deal of sun. We ordered food, beer was drunk (picture typical Mexican beach scene), and we left at 1:30 p.m. having caught quite enough sun. And too much sun I did catch. My head, chest, right arm, both hands, and right leg. Immediate application of aloe gel did little to alleviate the tingling sensation, so I stayed inside while the guys napped outdoors. In the evening we went for our usual walk along the main road in Tulum. I was still not hungry so simply had flan while the others indulged in full meals. We all felt exhausted from the sun exposure so made it an early night. 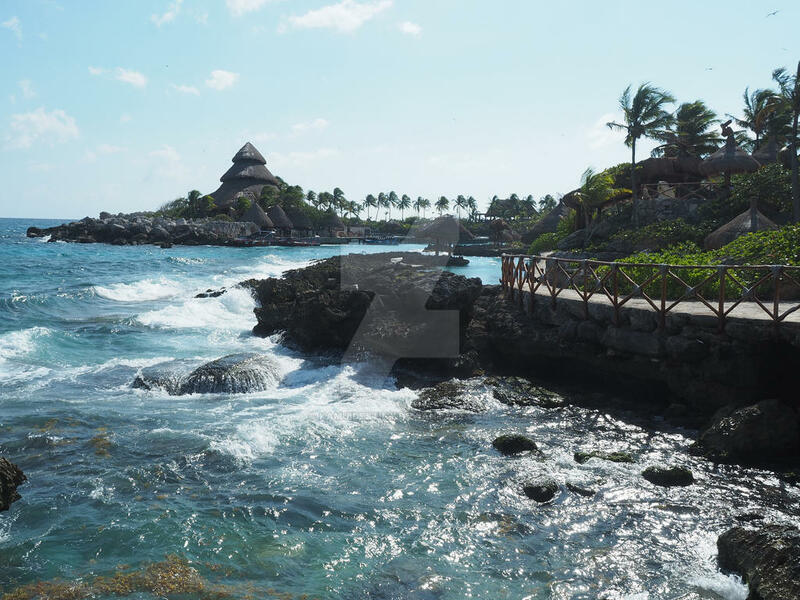 Xcaret! It was a 45 minute drive north, only ten minutes south of Playa del Carmen, and with breakfast once again starting not so promptly at 8 a.m., we arrived an hour after opening. Based on the number of vehicles and buses, however, it wasn’t too busy. Perhaps because it was a Tuesday in a shoulder season, the park had a comfortable number of people. The welcome center was a giant store maze and as such was off putting as the first experience of the park, but once we were on the other side we followed signs to see the aviary and big cats. Rather than finding birds we wound through a man-made grotto or cave-like structure that led us to a constructed Mayan village. 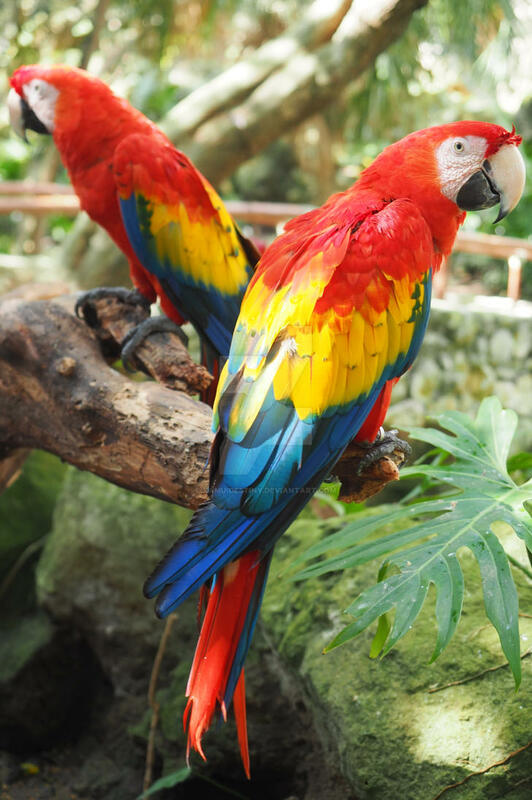 It was mostly deserted, so we passed through and found the trail again to the aviary, complete with winding walkway that included swinging bridges, starting from the top and spiraling downwards to the ground and exit. I thought it was well designed, although getting wet was unavoidable. 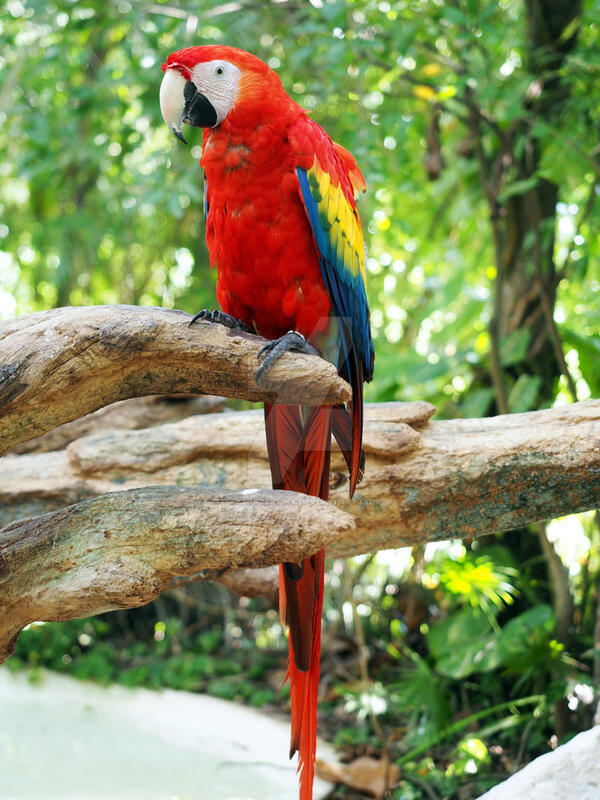 Along the path sat macaws and parrots that visitors could walk right up to and snap a photo with. At the exit was a group of pelicans standing in the spray of a waterfall. 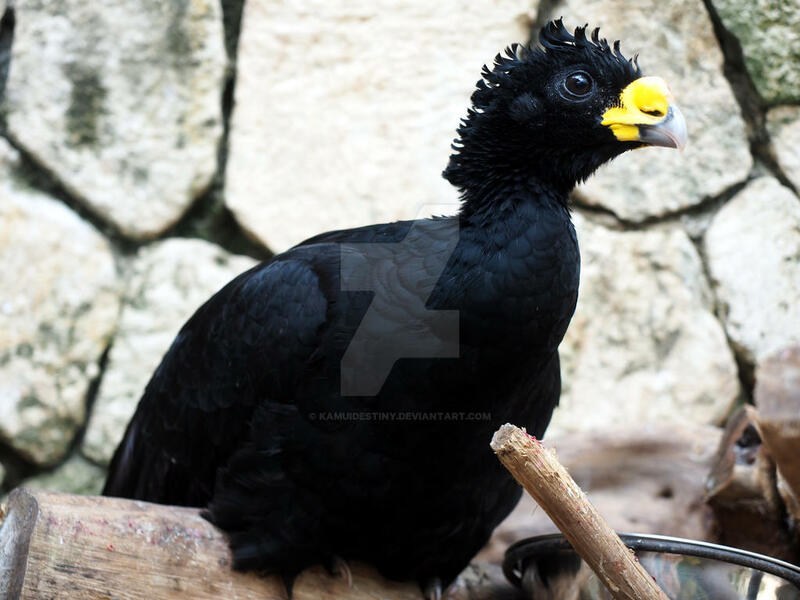 They reminded me a bit of dodo birds by the way they move and walk (as if we know how an extinct creature moved…). Beyond the aviary was the butterfly zone. They had several large blue butterflies, which were hard to photograph with their wings outstretched. This zone was also nicely done. 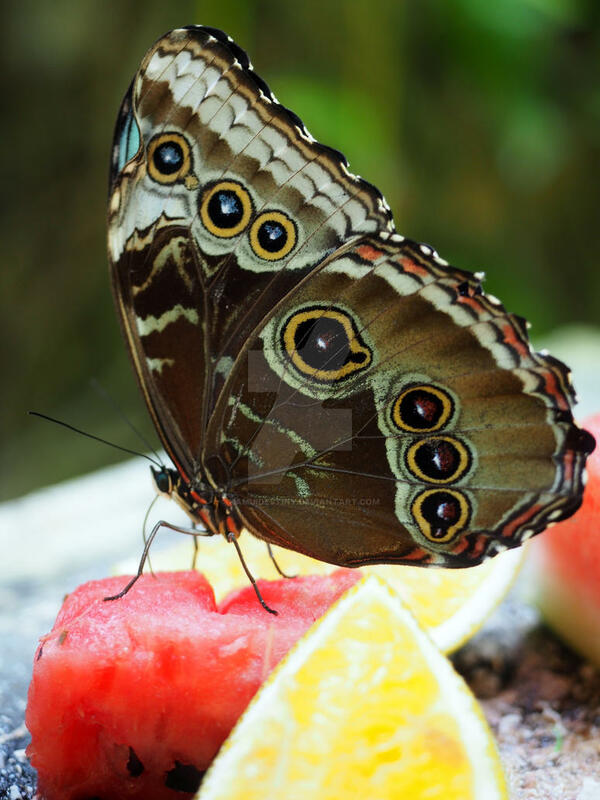 Plenty of fruit to keep the butterflies visible. We had to orient ourselves to find the large cats and stumbled upon a tortilla making demonstration along the way. Fresh hot tortillas, yum! The cats were okay to see. They lived on an island surrounded by a large crevasse that prevented jumping. Which is good, because the jaguar was definitely eyeing us up like we were lunch. Amazing to watch him move lithely, it was easy to see the power in its body. The puma, on the other hand, couldn’t be bothered. He was relaxing under a tree and hence not so photogenic. At that point we wanted to drop off the bags in a locker so walked across the park, seeing flamingos, tapir, and a few other critters along the way. The Xcaret Plus experience was where we ended up, so we took an underground river swim (float). We wore life vets, so it could have been more relaxing than we made it. I wanted to go down another river, but JJ wasn’t feeling very well afterwards, and I frankly couldn’t find another entrance. We walked along the shore front for a while, jumping into a tidal pool for a salty splash, following the inlet beaches and cabanas before turning back inland to grab or items from the lockers. In retrospect, we should have sent most of our belongings in a bag to meet us at the other end of the river (a service that was offered). Oh well. Lunch seemed like a good idea, but we continued to struggle with the map, eventually finding ourselves back on the other side of the park near an international buffet. And we stuffed ourselves silly. We passed by the cat island again on the way out, but the puma had only relocated to another tree. A nap seemed like a great idea, so we went back to the seashore, and I wanted to jump in another tidal pool but was too full. After hanging around at a cabana with a grumpy iguana for a half an hour, we made our way to the hammocks. We crashed for a while, and later Herr and I left to explore in hopes of finding another river to float down. Instead, we found the aquarium and sea turtles, a conservation effort Xcaret is heavily involved in, protecting them as younglings until they have matured enough to protect themselves. On the other end of the aquarium, which was meh (although it had rescued live coral), we came across an open air theatre where regional dance and music was being performed. One of the underground rivers ran along the backside of the stage, and several “floaters” had stopped to enjoy the performance. By the end it was nearing 6:30 p.m., so we backtracked to fetch JJ and head to the big event at 7 p.m. We attempted to view the orchids along the way, but it was already closed up. We did, however, come out at the horse show. JJ and Herr watched the end of that while I quickly walked through part of the art museum. When the show finished we walked to the large arena and were greeted by people dressed as Mayans and playing music. The show started off really cool. 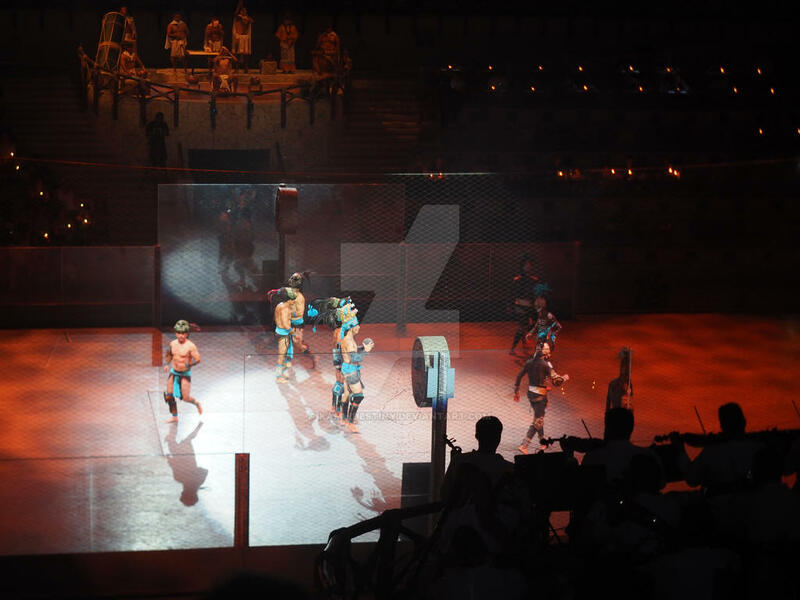 Interpretive style performance of the Mayans including a ball court demonstration and a hockey-like game played with a flaming ball and two fire cauldrons as the goals. Awesome to see, but it looked painful at the same time. After an intermission we watched Mexican history via song and dance from different regions. It was fine until Xcaret inserted its own “festival” that made me feel sorry for the dancers. I suggested we leave 15 minutes before the end of the two hour show so we could avoid the traffic. With a 45 minute drive ahead of us, the others agreed. At least the ride back had fewer speed bumps; they vary so much in Mexico it is hard to predict how bad they will be. It was a full long day, and we only experienced about 60% of the park. This would comfortably fill two whole days, and possibly three if one wanted to experience everything including some of their extra-fee activities. I would say a three day all inclusive package with the resort and park would be worth it. Breakfast starts at 8 a.m., but not promptly so we learned. Only green tea (and the hot water took a while), only watermelon juice (once they cut up the watermelon), then the standard array of fresh fruit (papaya, cantaloupe, and watermelon), yoghurt with optional granola, toast, and egg scramble. One tasty addition was warm ham and cheese quesadillas. I ate 4 or 5 of those. 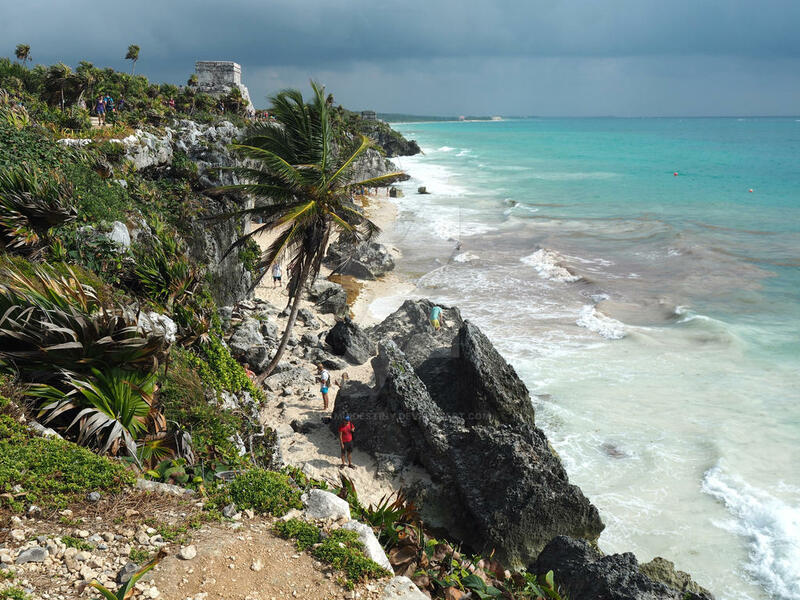 Today we chose to go to the Tulum ruins, which would have been our afternoon activity the day before but were too tired, especially when we had planned a day to relax the next day… So once breakfast was over we drove to the local archaeological site. I was once again surprised by how touristy it was. And expensive. Not as much as Chichen Itza, but close. We spent a considerable amount of time in line as the one ticket window that was open closed for nearly ten minutes. I was investigating the bookstore and other ticket options when it finally reopened. 225 pesos a person and we were in. The ruins are beautifully situated on the coast albeit mostly on the cliffs rather than a beach. The style was more simplistic and structures smaller, mostly I imagine, because living on the sea didn’t require large structures. We had walked down to a small bit of shoreline when the rain hit. I was in a swimsuit under my dress so didn’t mind too much until it turned into a downpour. When it finally let up, we made our way back up to see the remaining ruins. The views from the cliffs were fabulous and made me excited to check out the beaches, which are claimed to be nicer, quieter, and have whiter sands. This last bit seemed more aesthetic than useful until I felt the sand and how cool it was. Being so fine and white, it does not gather much thermal mass. Sadly, the books we purchased also got wet, so they are slightly water damaged now. Despite being burned out on ruins by this point, they were still lovely. The walk back to the entrance didn’t take as long, so we spent more time in the shops to avoid another bout of rain. From the ruins, I wanted to mark out where we would go for beach time the next day. 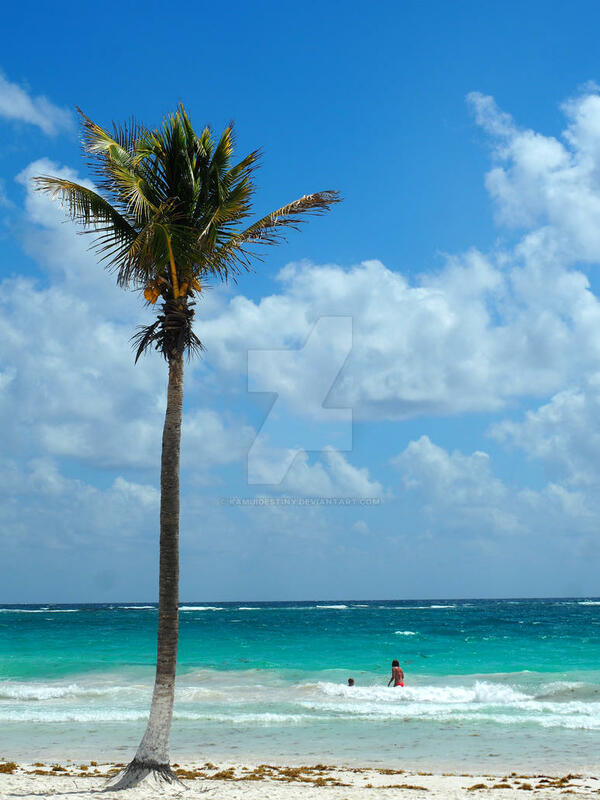 Tulum has a huge stretch of beach front supposedly with plenty of public beach access. So we turned down the road to the main drag and spotted El Capitan, a seafood restaurant, on the right so decided to stop for lunch. Herr and JJ both ordered ceviche, a plate of chilled fish and shrimp. I ordered a pot of rice with seafood, which turned out to be a lot like soupy paella. I enjoyed mine, but the other two couldn’t eat half of their dishes. Based on that and the price, we would not recommend it. Afterwards, we took the ominous drive south along the beach, except we didn’t see any beaches. Everything was private resort property along a narrow road, no place to stop, and we couldn’t even find an ice cream shop (the horror!). The rain really started to come down at this point, and we had passed through the southern gate into Si’an Ka’an before realizing the only way out was back the way we came. Herr made the not-so-fun drive back, our mission not accomplished. Across the street from El Capitan is a supermarket called Chedraui. On the way back from the “beach”, we bought a handful of drinks and pastries, as well as a new swimsuit for myself. Then when we returned to the hotel we indulged in our goodies and napped like good tourists, except I just cannot nap. At sunset we went for a walk along the main road and explored some shops. 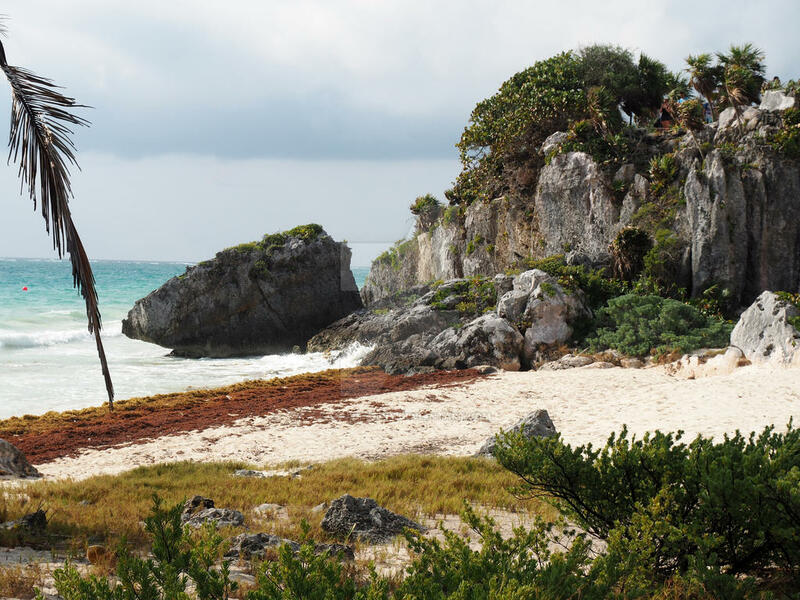 One rather evident point about Tulum is it has a strong “hippy” vibe. From dreadlocks and man knots to wheat grass and vegan options. Yoga on the beach is a thing, and one can smell marijuana at least once every walk. We chose a Mexican fare restaurant called Malquerida, where the guys ordered food and I went with flan. Food was decent, music from next door was nice. We had a long day planned next, so we returned to the hotel for the night.